Remember that one time we took the kids camping and I only took one picture. Yeah, this is the one picture. And it was of them in the back seat with all the junk packed up cause we were heading home. But since I can't put a blog post up about taking the kids camping for the first time with only a picture of them in the packed up ready to go car, let's talk about camping. Ah, camping. That was my finest "catch me a man lie" I told Chris. Dating Natalie says, "Oh yes! I love to go camping! It's so great sleeping in a tent out in the woods." Married Natalie says, "I hate nature and have a very nice temperpedic bed. Why would I want to go sleep in the woods, on the cold hard ground, where bugs could touch me." Chris loves camping! He loves the pretending to be homeless primitive camping where they dig holes and have to bring in their own water. I can tolerate camping. Even tent camping. As long as it's only for 1 night and there are flushing toilets available. This girl doesn't dig holes for anything. Early in our marriage we had some other friends who loved camping so we went maybe 2 or 3 times. And it was great. I enjoy the social aspect of sitting around a camp fire chatting with friends and roasting things on extended poles because I'm not cooking my food on dirty sticks. But after they moved I got a reprieve from camping. No one else to go with, means I don't have to go! In truth, I loved camping as a kid. I did all my time at LDS girls' camp. Every summer I spent a week in the woods, sleeping in a tent on the hard ground (no air mattress you sissies), in the pouring rain. And I loved it! Then maybe in our 4th or 5th year of marriage I got sent to girls camp as a leader. And that's when I realized I hated camping now. And the girls don't even tent camp we slept in cabins on cots and I STILL hated it. I have a death fear of ticks. And a low tolerance level for loud preteen and teenage girls now that I'm not one of them. So camping is generally a no go for me. Then the ward planned a camp out and Chris really loves camping and he really wanted to go and our friends were going to be there. So the social pull worked on me and I agreed to it. So we bought the kids some sleeping bags and headed off to the woods. 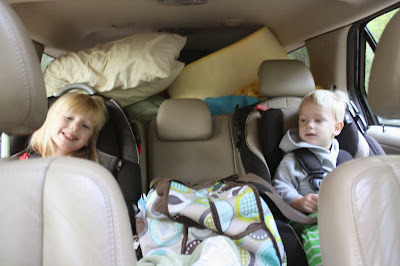 Here are the highlights from our kids first camping trip (and reasons for the lack of pictures). 1. I was hangry. It was a ward camp out so the hot dogs were being provided and were supposed to be there at 6. We got there at 5:30 and got everything pitched and ready. I hadn't eaten since BRUNCH that morning. NO LUNCH. And now the person in charge of food is late. I was ready to murder someone. And luckily we were in the woods and I had many sharp objects available so I'm fairly certain I could have gotten away with it. 2. It got dark, fast! By the time the people in charge of the food showed up, set up, and got a fire going it was pitch black. And refer to #1, I was hangry. So I was not about to walk back to my campsite to get my camera to take pictures of the kids not really eating their hotdogs. But eating enough chips that they can probably poop out a frito-lays factory. Thankfully Chris is a wise man and he plied me with as many hotdogs as I wanted without questioning me. And kept walking back to our campsite to get the various things I wanted. 3. Campfire Sing-A-Long At 8:30 there was a fireside which was also supposed to have a primary song sing-a-long. We headed over there because that was the night's entertainment. While we're waiting for everything to get started someone asks me to lead the group in a primary song sing-a-long. Say what! Thankfully Annie, who is also a wise woman and was aware that I might still be on a murderous streak, joined in at least. So everyone was seranaded with a duet by me, Annie, and a few of the kids who mumbled out some of the words. 4. "Very Tired Sarah" It was a really long day for the kids, neither had naps because we'd had our family fun day all morning and then came home packed up and headed to the camp site. Sarah near the end of the fireside was so exhausted she seemed like she was going to cry. So we skipped the smores and socializing with people to take the "very tired kids" back to the tent. 5. Magic Tent Energy However, suddenly upon entering the tent in their pjs the kids were recharged and had all the energy in the world. They ran around our tiny 4 man tent jumping and pillow fighting and giggling. It was hard to be angry when it was so freaking hilarious. We had to change their sleeping arrangements 3 times before we got them calmed down and they finally fell asleep. At one point they were just touching each other and then busting out giggling like it was the funniest thing in the world. 6. Tent Sleeping Champ Sarah, once she fell asleep she was out. She didn't wake up but once when the temperature really started to drop and she needed help getting back into her sleeping bag. Cody woke up a bunch but was easily put back to sleep by Chris. 7. Worst Tent Sleeper Natalie. I'm actually not sure I slept. With my sciatic nerve issues I was in excruciating pain. Add in the cold weather and hard ground and my hips were aching. But I think what really makes me a tent fail is at I-don't-know-what-time, I started nudging Chris because I needed to go potty and was not about to walk in the dark to the bath house by myself. So since I carefully worded the delegation earlier in the evening, "Chris, you are responsible for taking WHOEVER needs to go potty to the bathroom" he had to get up and take me. Adding more fun to the mix was trying to climb out over Cody who was sleeping right next to the door's zipper. 8. Morning Downpour There was a slight 10% chance of rain. Yeah, it poured at about 5:30 in the morning. So when we got up at 7 it was still raining and I was having none of it. We weren't going to hang out at a muddy camp to play games and try to cook food on wet firewood. So we carefully rolled everything up and I carried the kids to the car while Chris ran loads of things to the car. We packed up as quick as we could and headed to Chick-fil-a for breakfast. All in all it wasn't that bad. And the kids enjoyed it. I just need 1) a bigger and better air mattress and 2) a smaller group. I don't want to go to a ward campout. I just want to camp out with a few friends and their kids and sit around the fire and eat and chat. And maybe only be forced to do this once at most twice a year. This is so funny! And I totally get it - I consider camping a hotel with no room service.